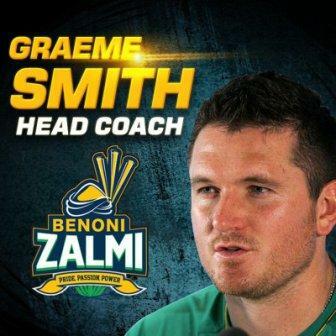 The Benoni Zalmi, a franchise co-owned by Suhail Galadari and Javed Afridi, have appointed the former South African captain Graeme Smith as the coach for South Africa's new T20 Global League tournament, according to an announcement on the team's Twitter handle. This is the first coaching assignment that the former South African captain has taken. Javed Afridi, who also owns a team - Peshawar Zalmi - in Pakistan Super League, unveiled Smith as the team coach in Cape Town on Monday. Smith, 36, has played 117 Tests and 197 ODIs for South Africa, besdies 33 T20 international matches. He had also featured in the veterans cricket league that was held in the UAE last year. One of the most prolific South African batsmen, Smith will have Geoff Toyana as his assistant coach. South African wicket keeper Quinton de Kock, who is an explosive batsmen, especially in the shirtest format of the game, is the marquee South African national player for the Dubai-based franchise. The first task on hand for Smith would be pick a solid squad during this weekend's player auction, which will take place in Cape Town on Sunday. Over 400 players are listed for the eight-team T20 Global League. Meanwhile, Afraid also launched the the new Benoni Zalmi logo in front of over 1000 the Benoni High School students. The logo has three words - Pride. Passion. Power - emblazoned on it. Benoni will be one of eight South African cities to host a franchise team during Cricket South Africa's newly formed T20 Global League in November and December. The Peshawar Zalmi Foundation, set up by Afraid, has done good work around the world through initiatives to create social cohesion, inspiring youth and women's empowerment and promoting education through sport. "Like Peshawar Zalmi, Benoni Zalmi will not only try to attract millions of cricket fans from across the world, but will also try to contribute to various corporate social responsibility activities in Benoni and in the country in an effort to win the hearts of the South African people," the local daily Benoni City Time quoted him. Despite being offered a franchise base in cities like Durban, Cape Town or Pretoria, Afridi decided to base his team at Sahara Park Willowmoore.